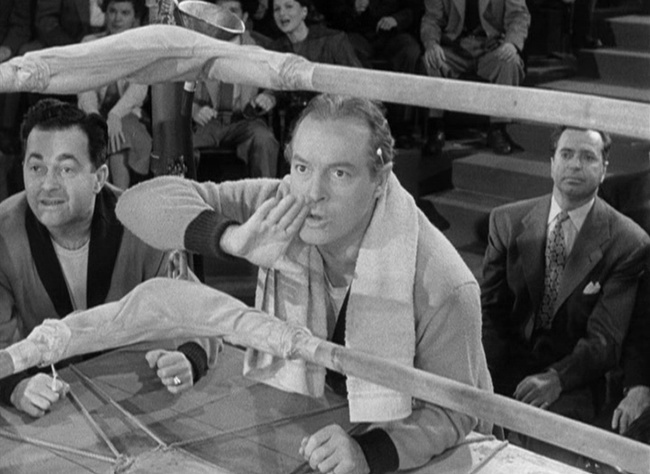 To hear Bob Hope tell it, he was never much of a boxer. He was exaggerating for comic effect. At least a little bit. As a young boy, Hope (born Leslie Townes Hope) showed at least some aptitude for the sweet science, training with his friend Whitey Jennings at Charlie Marotta’s famed boxing club in his hometown of Cleveland, Ohio. At least enough that he briefly flirted with giving up his other jobs as a newsboy, dance instructor, soda jerk, shoe salesman, and pool hustler, and try to make a career out of it. With that goal idly floating around in his head, the 16-year-old Hope entered the Ohio State Boxing Amateurs tournament at Cleveland’s Moose Hall under the name “Packy East,” a nod to the popular light and welterweight boxer Patrick “Packey” McFarland and his high school, East High, in July, 1919. Hope moved up in the tourney brackets and easily won his next fight by default when his opponent, Joe E. Morgan, failed to show. Young Packy East managed to make it to the finals, but that was when both his luck and skill ran out. His opponent, Happy Walsh, showed up. And he didn’t make any rookie mistakes like looking back at his corner. Hope did end up making a career out of boxing, in a sense, though, as the sweet science ended up becoming somewhat of a staple in his comedy. It started out simply enough, with throwaway jokes about his lack of pugilistic prowess. In 1948, though Hope took his boxing humor to the next level. Performing as part of a charity show for the US air force at Madison Square Garden, the comedian challenged boxing legend Jack Dempsey to a bout. Hope/East won via knockout mere seconds into the fight. It was obviously a very serious and real affair. General Eisenhower was a big fan. 20 years later, Hope laced up the oversized gloves again to face Rocky Marciano at a Salute to the USO, also held at MSG. That night, over 19 000 fans watched Hope and Marciano fight to a no contest and then break into a dance party filled with random celebs and boxing heroes. Packy East made one final appearance when he faced Sugar Ray Robinson for a charity match for the Sugar Ray Youth Foundation on April 21, 1972. East’s manager predicted a quick finish in the press leading up to the big event, but no official outcome is listed anywhere on Packy’s illustrious and ridiculous boxing record. Hope wasn’t quite done with boxing yet, though. 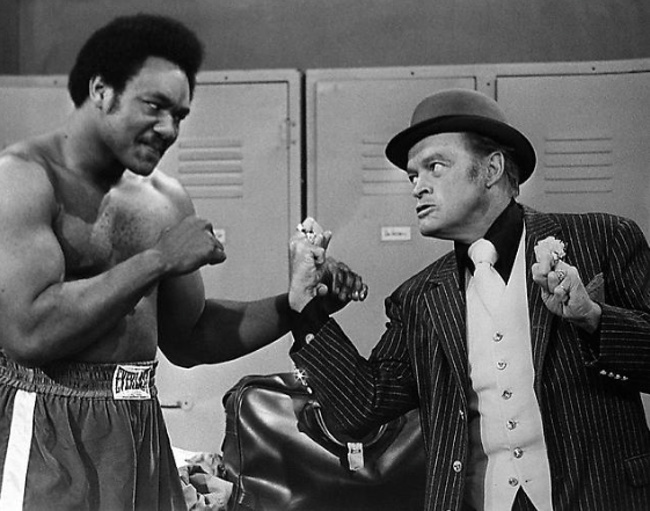 He parodied Rocky for a skit from 1977’s Bob Hope’s All Star Comedy Spectacular, which also stars Ann Margret (as the Adrian-like figure) and Sammy Davis Jr (as the Apollo Creed-ish foil). None other than Muhammad Ali shows up for a cameo at the end.